brokers vision : Former management vessel annex laboratory ship of the German waterways authorities (WSA Essen), which in 2009 was completely refurbished into a day passenger ship with a maximum of 42 passengers. There was also a nice cabin for the owner with its own bathroom realized. At that time the vessel was also extended by 8.90 meters. No costs have been spared during the rebuilt, professional techniques and materials have been used with the result that it has become a very solid barge. Due to the rudder propeller and the bow thruster, this unique vessel is very manoeuverable and therefore also very suitable for sailing alone or with two people. The central heating system together with the good insulation and the double glazing makes it possible to live on board, while the good view to the outside certainly enhances the living on board. Also foreseen with 2 spud poles up to approx. 4 meters under the bottom. Costs for the change of ownership and / or deletion are for purchasers amount. Additional information: The techniques used on board are commercial shipping quality. Great vessel for sailing on the French canals and rivers. 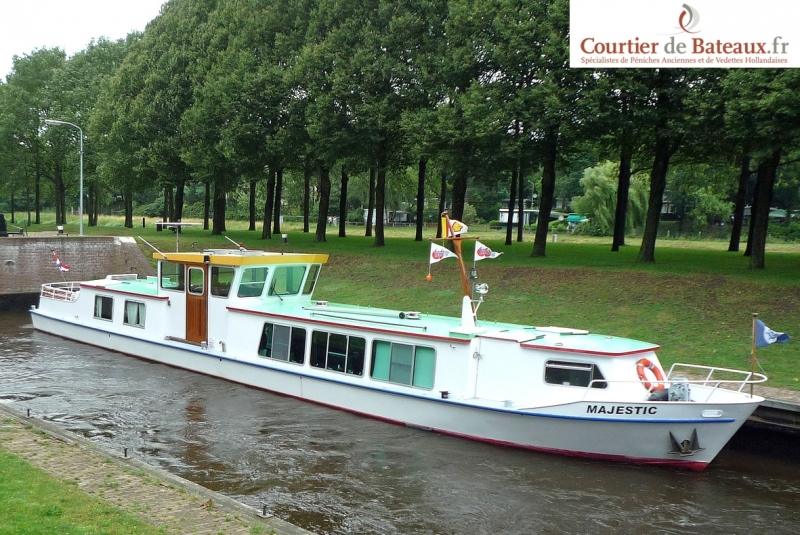 Great vessel for sailing on the European canals and rivers. The ship was completely gutted (only the hull is old) and then rebuilt. Before refitting the interior, the inside of the hull was thoroughly treated.